M. Irene Woodin - age 89, of New Minas, Kings County (formerly of Halifax) passed away, surrounded by her loving husband and family on Thursday, March 21, 2019 in the Valley Regional Hospital, Kentville. 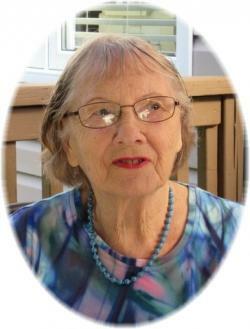 Irene was born on September 24, 1929 in Halifax to George Chesley and Myrtle (Taylor) Brushett. A proud wife, mother, grandmother, and great-grandmother, Irene moved to the valley upon the retirement of her husband, Hector and they enjoyed an active, fun filled retirement together including 32 years with various square dancing groups in the valley. She loved music and dancing and could frequently be found at various concerts and senior events throughout the area. Irene was extremely proud of her family, especially her husband of sixty eight years. Her concern was always for the well-being and activities of her family, above her own. She found great joy when surrounded by her family and took great pleasure in preparing for and gathering them all together for special occasions and celebrations. Surviving are her husband, Hector; children, Daniel, Ronald (Colleen), Lindsay (Alex) and Crystal (Bruce) Warren; grandchildren, Steven (Lisa), Heather, Julie (Simon) Hodge, Kyle (Rebecca) Warren, Todd (Jackie) Warren and Scott (Jenn); 14 great grandchildren. In addition to her parents, Irene was predeceased by brother, Chesley Earl (Lucy) Brushett; grandson, Christopher Dean Woodin; sister-in-law, Leila (Charles Jewers) and daughter-in-law, Sandra Woodin. The family would like to extend their most sincere thanks to the excellent staff at the VRH, Dr. Nunn as well as those who assisted in her time of need. Cremation has taken place. There will be no visitation by request. The funeral service, followed by a reception, will take place on Thursday, March 28, 2019 at 10:30 am at the White Family Funeral Home, Kentville, Reverend Ivan Norton officiating. Burial will take place at a later date. In lieu of flowers, donations in her memory may be made to the Heart and Stroke Foundation or any charity of your choice. Funeral arrangements have been entrusted to the White Family Funeral Home and Cremation Services, Kentville.